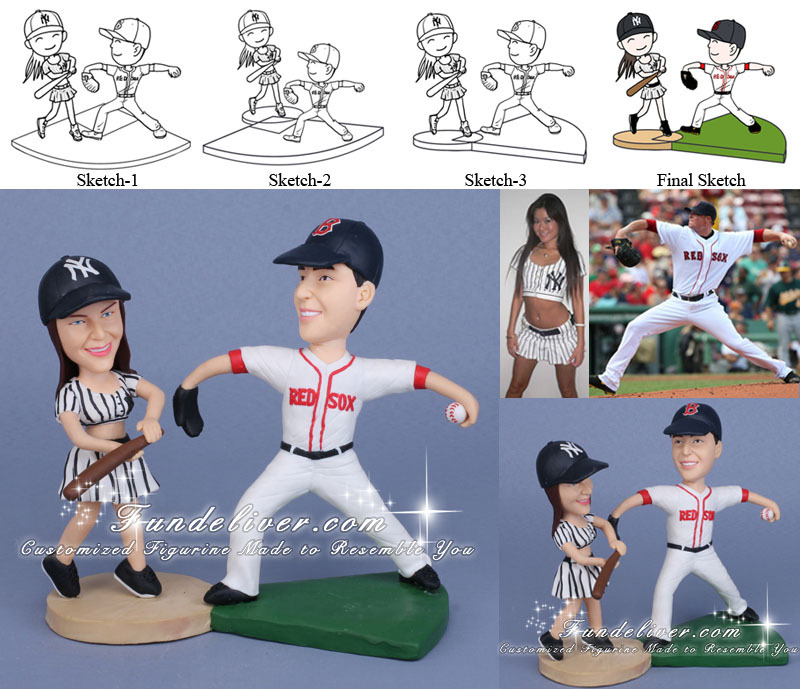 This is a completely customized Boston Red Sox and New York NY Yankees wedding cake topper ordered by one of our customers. The groom is in Boston Red Sox uniform and Red Sox hat, pitching a baseball to the bride and bride is in New York Yankees uniform and NY Yankees hat, holding a baseball bat ready to hit a home run that her groom is throwing her. Is your groom a big fan of a certain team or activity? Are you super fan of Boston Red Sox or New York Yankees? Leave no doubt with this fun, themed baseball wedding cake topper. 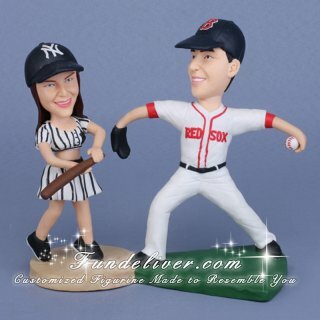 Your ceremony will be the talk of the town with this fun, fabulous Boston Red Sox and New York NY Yankees cake toppers! We still have many other cake toppers for baseball, like White Sox Wedding Cake Topper or Chicago Cubs wedding cake topper. And the most important thing is our cake topper is customized, so if you have any idea in your mind, feel free to tell us, we can make it come true and match your wedding and personality perfectly.